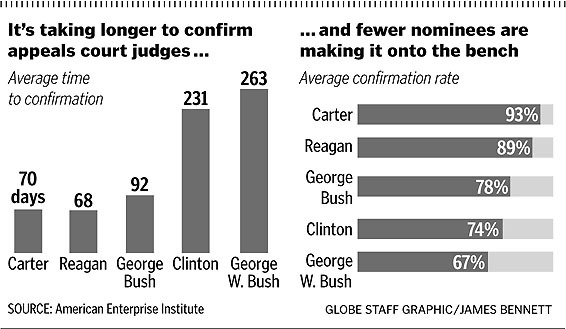 The Boston Globe uses my numbers on the confirmation process this last week. "Virginia Sen. George Allen wants to repeal D.C.'s law banning handguns inside the city. The Republican senator has schedule a news conference today with Senators Kay Bailey Hutchison and John Cornyn, from Texas, to introduce the bill. D.C. Police Chief Charles Ramsey and other city leaders have fought similar efforts in the past. . . ."
A special commission formed by Gov. Rendell to combat a surge in gun violence statewide failed to support two key gun-control initiatives backed by Mayor Street and other city officials. . . . They were not just Street's proposals, they were also Rendell's. Six measures to put restrictions on people buying guns were defeated by the House Rules Committee yesterday. The rules would have prevented people placed on watch lists by police or those with felonies in other countries (despite different evidentiary rules) from being able to buy guns. Thanks very much to Jason Morin for sending me this and several other recent links. I do appreciate them. This study examines crime trends in Commonwealth countries that have recently introduced firearm regulations: i.e., England, Australia, and Canada. The widely ignored key to evaluating firearm regulations is to examine trends in total violent crime, not just firearms crime. The U.S. provides a valuable point of comparison for assessing crime rates because its criminal justice system differs so drastically from those in Europe and the Commonwealth. Perhaps the most striking difference is that qualified citizens in the U.S. can carry concealed handguns for self-defense. The upshot is that violent crime rates, and homicide rates in particular, have been falling in the U.S. The drop in the American crime rate is even more impressive when compared with the rest of the world. The Minnesota House today passed a measure that would allow sane, law-abiding Minnesotans to get a permits to carry loaded weapons in public. The 86-47 vote sends the bill to Gov. Tim Pawlenty for his signature. He is expected to sign the bill, which is essentially a reenactment of a 2003 gun permit law that the state Appeals Court overturned last month. The Minnesota Senate passed the measure last week. The House debate on the bill was sedate and, at less than three hours, rather short . . . . It is hard to remember how tough the votes were when the legislation first passed two years ago. Now that the horror stories have proven to be false, you have almost two-to-one votes for the bill. Edgar Sutter has three interesting sites that deal with different aspects of guns. Dr. Edgar Suter's letter regarding Coben & Steiner's "Hospitalization for firearm-related injuries"
Star Wars, Lucas, & Anti-war Commentary on Bush and Iraq? Nonsense, says Mr. Lucas. He told reporters that any analogies found in his latest effort are strictly historical. He noted he had read histories of how democracy had been subverted by the Romans under Caesar, the French under Napoleon, and the Germans under Hitler. He pointed out that the original 1977 Star Wars movie "was written during the Vietnam War and Nixon era, when the issue was how a democracy turns itself over to a dictator -- not how a dictator takes over a democracy." He said that parallels between the war depicted in the film and the Iraq conflict were also overblown: "When I wrote (the Star Wars treatment), Iraq didn't exist. We were just funding Saddam Hussein and giving him weapons of mass destruction." Mr. Lucas' wish to distance himself from those who would exploit his latest Star Wars epic for political purposes is shared by Ian McDiarmid, the actor who plays the manipulative Supreme Chancellor Palpatine in the film. When asked if his character's preaching of peace while pursuing conflict involved any references to President Bush, he demurred. He says he modeled his character more along the lines of Serbian dictator Slobodan Milosevic, whom he described as "quite Sithian, actually" referring to the evil rivals of the virtuous Jedi Knights. A Pulitzer Prize for this? Cleveland Plain Dealer columnist Connie Schultz was awarded a Pulitzer Prize for commentary that, among other things, bashed Ohio CHL-holders in 2004 as "Dirty Harry wannabe's". The Plain Dealer got more specific when bragging about the award, saying the AP specifically gave this award to the newspaper because it had abused the Media Access Loophole by publishing the private information of concealed handgun license-holders. Of course, the Plain Dealer's actions endanger people's safety. Possibly this means that they will give Newsweek a Pulitzer for their inaccurate coverage of the Koran being flushed down the toilet. While it is a little outside my normal topics, Xrlq has an interesting discussion of the Supreme Court decision on shipping wine. The case is apparently much more narrowly decided that most people seem to realize. It is one of the more amusing discussions that I have come across recently and the debate at the end is also fun to read. "They are free, and they are safe, and they are making homes safe," said Terri Goodwin, a victim advocate with the Brevard County State Attorney's Office. "If the public doesn't take advantage of this, then they risk having something happen that will alter their lives forever." The locks come courtesy of Project ChildSafe, a program funded by the U.S. Department of Justice and sponsored by the National Shooting Sports Foundation. It would be nice if that were the way that things worked out, but the evidence shown here indicates that more lives are lost from gun locks. Accidental deaths don't change, but unfortunately when guns are not available defensively criminals become emboldened and are more successful in their attacks. Speaking of doing what feels right, it also looks like Minnesota's effort to pass its own assault-weapon ban — to replace the equally misguided federal law that thankfully expired in September — is going nowhere. Section 1 of SF1946 lists the usual litany of mean-looking weapons: the AK-47, MAC-10, Uzi and AR-15. The AR-15 is my favorite because it perfectly illustrates the illogic of this legislation. The AR-15 fires the same bullet at the same muzzle velocity at the same rate of fire as the Ruger Mini-14. More important, a Ruger Mini-14 was used in the shooting of Edina police officer Michael Blood during a November 2000 bank robbery. So why is the AR-15 on the list and the Ruger isn't? Because it looks scarier. This lunacy is made clearer when you consider that assault weapons are used in a minuscule number of crimes. This is apparently news to Sen. Satveer Chaudhary, sponsor of the assault-weapon ban. "Law enforcement often encounters these weapons," he told me. "Assault weapons in general are the gun of choice for criminals." Sorry, Senator, but guns aren't the weapon of choice in assaults. According to 2003 Minnesota BCA statistics, guns were used in 1,140 urban aggravated assaults. Knives were used in 1,592, "other weapons" in 1,553, and hands and feet in 1,883. So if the Senate and the numerically challenged Million Moms — who wrote the Minnesota assault-weapon legislation — really want to make a difference, they'll start a movement to cut off the hands and feet of repeat violent offenders. Banning assault weapons will have little effect. Which brings us to the other bit of foolishness proposed in the bill. It also takes on .50-caliber sniper rifles and the Fabrique Nationale Five-Seven pistol. The .50-cal, used by military snipers to disable armored personnel carriers and aircraft, is indeed a powerful weapon. But there's no record of one ever being used to commit a crime. Some farmers have lost $15,000 to $20,000 worth of cotton in a field because of deer that eat the young plants, said Jerry Multer, president of the Wall Co-Op Gin southeast of San Angelo. . . .
Campbell's plan allows farmers to apply for the permit before planting season by showing that deer have damaged crops in the past and are likely to do so again. That way, farmers will have a permit to shoot deer during the first week crops begin to grow, when deer most often eat the plants. JONESBORO, Ga. -- More judges in Georgia are packing guns following a shooting that left three people dead at an Atlanta courthouse. The sheriff of one county said since then officers have given guns to eight Superior and State Court judges. Police said some judges have also asked for some firearms training. State law allows judges to carry guns in court. And one judge said while a few of his colleagues have always carried weapons, more are now bringing their own guns to work. One judge said he likes having his gun with him because it gives him "a great deal of confidence" that he'll complete the day. By making such extreme predictions, gun control advocates keep on losing credibility. Once they start losing some debates the losses help feed on each other because they affect their credibility later on. You would think that they would learn their lesson and not keep making such extreme claims. Professional doomsayers are having something of a field day, fomenting hysteria over recent passage in Florida of a law that lets citizens defend themselves against criminal attack without first making an attempt to flee. James Courter, a former New Jersey congressman who chaired a 1993 base-closing commission, told me that he heard every dire prediction imaginable that communities that lost their bases would die. "In fact, those places that planned ahead, aggressively sought out alternatives and improved their economic incentives often came out ahead of where they were," he says. "Swiss shooters target Schengen accord"
Will the Swiss vote to accept the EU's more stringent gun control in order to get more trade? Shooting is more than just a sport to many Swiss, who believe a whole way of life would be under threat if the nation signs up to the Schengen accord. Geared to improve cross-border security, the European Union agreement also lays down minimum requirements for acquiring and possessing firearms.